December 2011: Tips, eNews and More! Valentine's Day, Mother's Day, Father's Day, Halloween, Thanksgiving, done … Where did 2011 go? The holiday season is just around the corner. Whatever holiday you celebrate we would like to wish you and your family a season to smile. IMPORTANT: During the holidays we will be closed from December 22nd to January 2nd. If you would like to request an appointment before seeing family and friends during the holidays, please make appointment requests accordingly. Has it been a while since we last saw you? Were you waiting for your benefits to renew? We are now booking appointments into 2012. We would love to help make 2012 a healthy, beautiful year for your smile. It's hard to believe 2012 is upon us, it's going to be a great year! We would like to thank you for offering us the opportunity to care for your family over the past year. We are always looking for ways to improve your experience at our office. Please take a moment and let us know how we can improve in 2012. We look forward to making you smile for years to come. Help us improve your experience by completing our 5 question survey. All entrants will be entered in a draw to win delicious gourmet cookies for your family and friends to share! Other great prizes include an official Port Hope Dental scarf or blanket to keep warm during this cold winter. For full contest rules, please contact the office. It's a win, win situation! The winner will be notified and announced in the January newsletter! We were extremely happy to welcome Laura's daughter, grade 9 student Mallory, to our office on November 2 as part of the "Take Our Kids To Work" program. 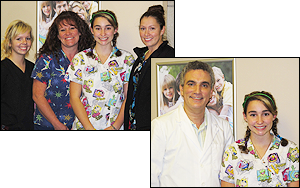 We were excited to show her the full dental experience, helping patients achieve great smiles! As you can see from the photos she became very involved in the patient care and learned a lot being about hygienist, just like her mom. She was a natural! Thank you to all the patients for allowing her to have this experience. We wish Mallory the best in her bright future. 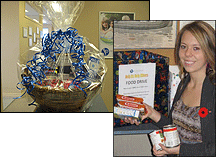 Port Hope Dental Food Drive! Between November 1st - December 13th, our team is holding a food drive to benefit the Northumberland Fare Share Food Bank. We appreciate the many non-perishable food items that have been donated already! If you haven't donated a non-perishable food item yet, there's still time! If you donate by December 13, you will receive a ballot to enter to win a gift basket. Here is a simple schedule to show you how to easily include more water in your day. Click here to see! This time of year there are plenty of holiday parties and get-togethers to attend. 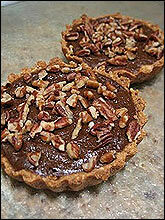 If you want to bring something a little different check out this month's recipe! Some of the ingredients may require you to explore the supermarket, but the result will be delicious and a great conversation piece. The recipe calls for yams but you can substitute sweet potatoes if yams are unavailable. Yams and sweet potatoes look the same, they taste the same and unless you are a culinary expert you likely never really know which you are eating! When it comes to their nutritional content and health benefits both yams and sweet potatoes are similar. They are a great source of beta carotene, an antioxidant found in most orange fleshed foods such as mangoes and carrots. They are also high in vitamin A and C and contain a good amount of thiamine. They are nourishing to the spleen, pancreas and stomach.